QuickBooks is an online accounting software that helps businesses keep their finances in check. Connect your bank account, send professional invoices, track your expenses and more using QuickBooks’ software, also available on mobile. Hubstaff‘s QuickBooks time tracking integration is available for Mac, Windows and Linux. Our natively designed desktop time tracking apps allow users to efficiently track time, monitor work, view time reports and export time to QuickBooks to make payments seamless and simple. Integrate QuickBooks and Hubstaff today to access Hubstaff’s many productive time tracking tools and insights. Track time on an intuitive desktop timer, which was natively designed to work seamlessly in Mac, Windows and Linux. 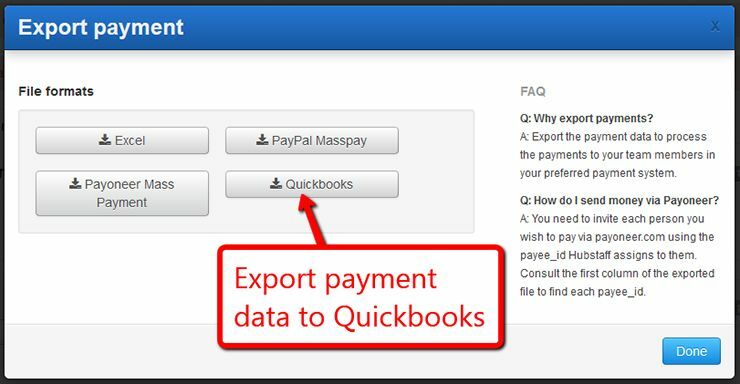 Export time data directly to QuickBooks from Hubstaff without having to worry about manual entries. Schedule payments for the exact amount of time worked. Access detailed time reports that can be downloaded or emailed. 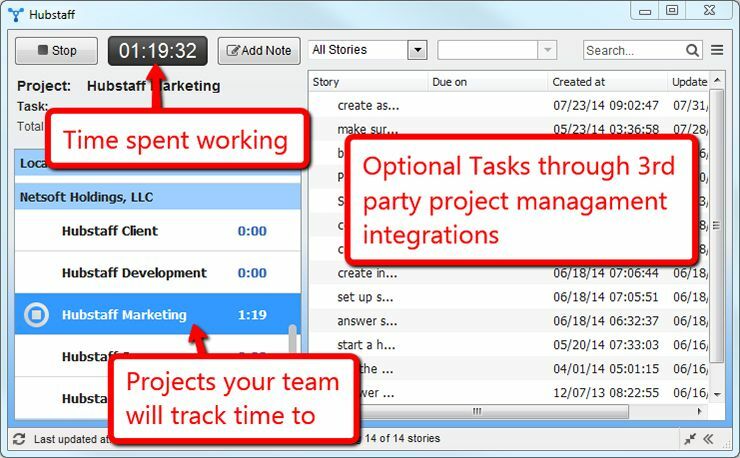 View randomized screenshots so you know what your teams are working on while tracking time. View activity levels calculated from mouse movements and key strokes. Learn more about the QuickBooks Time Tracking integration here. Hubstaff’s desktop app provides an intuitive way to track time with an accurate and easy-to-use timer. Track time with the push of a button. Work offline; the app will upload time records once it reconnects to the Internet. View all ongoing projects assigned to you in one convenient location. Add work notes from the app to communicate with your team. These can be used as reminders or memos and will appear on time reports. Hubstaff’s lightweight desktop app also gives you insight on how well your teams work with our innovative and insightful tools. 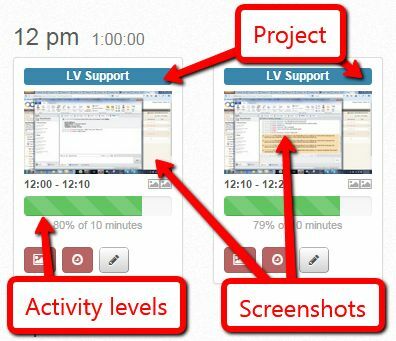 Randomized screenshots give you a good idea of what your employees are working on while tracking time. Screenshots can be sent to clients as proof of work. Screenshot frequency can be adjusted to 1, 2 or 3 screenshots per 10 minutes. You can also turn this feature off, or opt to blur images. Activity levels are calculated by counting key strokes and mouse movement. Analyze activity levels to find your most productive employees. Learn more about Hubstaff’s employee monitoring tools here. Hubstaff generates automatic time reports based on the time your employees and/or contractors track. These reports can be quickly and efficiently exported into QuickBooks for a seamless time tracking setup. Hubstaff’s time reports can also be used in various other ways to help your business succeed. Download, export or email reports. Filter reports by user, project or date range to find the information you need. Use reports to invoice clients for the exact amount of time spent on services. Reports can also show activity levels, so you can tell who has been the most active at work at a glance. Once Hubstaff and QuickBooks are connected, you can pay your team for time worked through QuickBooks. Just export time entries to QuickBooks and your records will be copied quickly and accurately, so you can pay your teams easily. Hubstaff also offers convenient automatic payments that you can set up right from within your Hubstaff account. Schedule payments to send out weekly, bi-weekly, monthly or twice a month. Set pay rates for individual team members. Pay teams for the exact amount of time tracked, down to the minute. Send payments manually or automatically.